Category: Pre & Post Birth. With a large display, pre-set modes and, most importantly, the integrated boost button, Elle TENS is a breeze to use. In fact it because of its effectiveness, simplicity and no-fuss that Elle TENS is one of the worlds most popular choice for mums-to-be. Elle TENS can be used from the onset of labour. 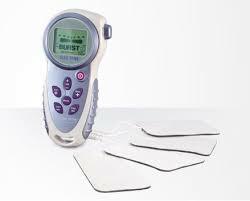 Simply apply the 4 pads to your back as shown in the instructions and turn on Elle TENS . You will feel a pleasant pulsing sensation; this will help to increase your own pain relieving chemicals known as endorphins.